About one in 9 Australians has asthma - a chronic (ongoing) condition that affects the airways in the lungs. Asthma affects both children and adults. 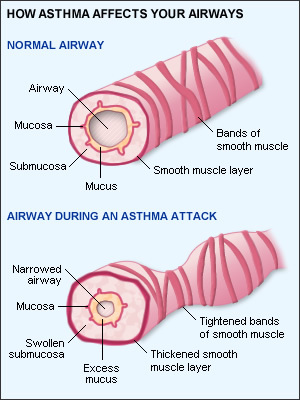 People with asthma have inflamed airways that are highly sensitive, and when exposed to certain triggers, their over-sensitive airways narrow, or constrict, making breathing difficult. While there is no cure, most people with asthma are able to control their symptoms by avoiding their triggers and taking medicines. Asthma can be life-threatening in some people, so it’s important to work with your doctor to monitor and control your asthma as much as possible. Most people with mild asthma feel well most of the time and their symptoms are easily controlled with treatment. They may experience symptoms from time to time when they have episodes of airway narrowing, usually after exposure to one or more triggers. People with severe asthma have regular or persistent symptoms that are more difficult to control with treatment. The exact cause of asthma is not known. What is known is that lots of factors contribute to its development — for example, a family history of asthma, or a personal or family history of allergic conditions such as eczema or allergic rhinitis (hay fever). Exposure to tobacco smoke (especially early in life) can increase your risk of developing asthma. tightening of the bands of smooth muscle around the airways (known as bronchoconstriction). What can trigger asthma symptoms? Many things can trigger asthma symptoms, and asthma triggers vary from person to person. For many people with asthma, it is an allergy that brings on (‘triggers’) their asthma symptoms. Other triggers include vigorous exercise (exercise-induced asthma) or having a cold. In fact, colds and flu are the most common triggers of asthma attacks. These viral infections can aggravate your airways, nose, sinuses, throat and lungs, causing a flare-up. Thunderstorm asthma is asthma that is triggered by the combined effects of weather conditions, pollens and other airborne allergens. The table below shows some common asthma triggers — those that are allergens (substances that provoke an allergic reaction) are on the left, and those that can trigger asthma symptoms but do not involve an allergic reaction are on the right. Peak flow tests use a peak flow meter to measure the speed of airflow out of the lungs. A spirometer can measure the total amount of air you can breathe out after taking a deep breath in (forced vital capacity - FVC), and how much air you can blow out in one second (forced expiratory volume in one second - FEV1). Lung function tests can also test the effect of asthma medicines on your breathing. To diagnose asthma, your doctor will want to confirm that your symptoms come and go. In addition, the lung function tests should show variation in lung function. In other words, airflow is limited some, but not all, of the time due to airway narrowing. If symptoms and lung function are improved with asthma medicines, that can help to confirm the diagnosis. avoiding or controlling the triggers that set off your asthma. It’s important to work with your doctor to create a written individual asthma action plan to help you achieve good asthma control and manage asthma flare-ups as soon as they happen. Asthma action plans help you recognise if your asthma is getting worse and tell you what to do about it. Your plan should be readily available - you can upload it to a asthma management app or print several copies of the plan. If your child has asthma you should provide their school, day care and other carers with a copy of the plan. Monitoring your symptoms and airflow helps you recognise when your asthma is well controlled and when it isn’t. You should be aware of the symptoms and signs of worsening asthma, such as needing to use your reliever medicine more frequently. Regularly monitoring your lung function with a peak flow meter also helps you identify changes in your asthma or flare-ups early. It’s a good idea to record your symptoms and peak flow scores in a diary. Alternatively, the National Asthma Council Australia has a mobile only website (similar to a phone app) for asthma management called ‘Asthma Buddy’. If your peak flow measurements are lower than normal or your symptoms are worse, you should check your asthma action plan. You may need to adjust your medicines and see your doctor. Medicines for asthma are often described as relievers and preventers. Most regular asthma medicines are delivered by an inhaler device (often called a puffer), although some are available in tablet form. There are also some medicines — used in specific circumstances, such as treating asthma flare-ups — that are given via injection. Relievers: these medicines are known as bronchodilators because they help to open up the airways, helping you to breathe more easily when you're having difficulty. Unless advised otherwise by your doctor, relievers should be used on an ‘as-needed’ basis for the relief of asthma symptoms. Preventers: these work by reducing the underlying inflammation of the airways, helping to reduce the likelihood and severity of asthma flare-ups. Unlike reliever medicines, you should take your preventer every day, as prescribed by your doctor, to help keep your asthma under control. Some asthma products contain a combination of a preventer and a reliever to help keep asthma under control. Make sure you visit your doctor regularly for check-ups to ensure that you are taking the correct medicines for your asthma, and using your inhaler correctly. Remember, different people have different triggers, so knowing what triggers your asthma is an important first step. By avoiding your triggers, you can reduce asthma flare-ups. It’s important for people with asthma to avoid tobacco smoke (including smoking and passive smoking). Avoid any medicines, foods and food additives that are triggers, and try to avoid allergens as much as you can. Allergy testing and treatment with immunotherapy may be recommended for some people. Talk to your doctor if exercise triggers your asthma - there are steps you can take to manage this situation. Colds and flu are among the most common triggers for asthma. While it’s impossible to avoid all infections, getting a flu vaccination each year greatly reduces your chances of catching influenza (the flu). The best time to be vaccinated is in autumn, before the start of flu season. Influenza vaccination is recommended for all people older than 6 months who want to avoid the flu and its complications. It is strongly recommended (and available for free) for children and adults in Australia with severe asthma. Ask your doctor whether you are eligible for free influenza vaccination under the National Immunisation Program Schedule. Frequent hand washing with soap and water can also help stop the spread of cold and flu germs, and may help you avoid getting sick. There is currently insufficient evidence from clinical trials to support the use of most complementary therapies in the treatment of asthma. The National Asthma Council Australia recommends that the use of complementary therapies should not take the place of conventional treatments for asthma. Also, complementary medicines can cause side effects, and some products can cause serious allergic reactions. Make sure you discuss the safety of any complementary or alternative treatments, including changes to your diet, with your doctor before you try them. Don’t be put off the idea of travelling just because you have asthma. There are a few easy precautions that you can take before you leave, and some things to keep in mind to make sure you have a healthy holiday! You should consult your doctor well before you plan to depart to make sure your asthma is properly controlled and that you have a current written asthma management plan for both relief and prevention of asthma. You should also know how to cope if your asthma gets worse. Remember to take a copy of your plan with you. Also, ask your doctor for advice about the conditions that could affect your asthma and the medical facilities available at your destination. If you are going overseas, ask your doctor to write down a list of all your medicines, including the brand and generic names (brand names can differ markedly from one country to another) and your doses. This will be handy not only if you have to see a new doctor but also when going through customs. How will a holiday affect my asthma? Some people find that their asthma symptoms improve when they go on holiday, usually as a result of differing asthma trigger factors. Some of these, such as household pets, are left behind when travelling. However, you could find that your asthma gets worse during a holiday. This is often the result of increased exposure to triggers or exposure to new triggers. Your asthma may be affected by the different climate, an increased pollen count, or increased exposure to farm animals or household pets. As emotions are often a trigger for asthma attacks, the over-excitement and stress sometimes experienced when travelling can be bad news for people with asthma. On the other hand, many people become less stressed while relaxing on a holiday. Rapid changes in temperature can trigger your asthma, such as moving from an air-conditioned aeroplane to a tropical climate. Always wear appropriate clothing in cold weather, rugging up with warm jackets, gloves and a scarf to cover your nose to warm the cold air you will be breathing in. Also keep in mind that asthma attacks often occur after a thunderstorm, when significant changes in humidity and temperature and the rain can cause grass pollen grains to rupture and release minute particles into the air that can be breathed in. How can I stay healthy on my holiday? Because viral infections, such as colds and influenza, are among the most common triggers of asthma attacks, you should try to avoid picking these up when travelling. Make sure you have a 'flu shot every year if you have severe asthma. Your doctor will be able to advise you whether you should have one. When you feel a blocked nose coming on or signs of a cold or ’flu, follow your doctor’s instructions on your self-management plan regarding increasing the dose of your medicine or inhalers. When you are away from your home you can no longer guarantee the cleanliness and fabrics of your pillows and bedding. You could take your own pillow or pillowcase with you, if practical. You should also warn airlines or accommodation providers well in advance of your trip of any food intolerances or hypersensitivities that you have. Remember to take adequate asthma medicine for the duration of your trip, plus some extra. It is best to pack your medicine in your carry-on luggage if flying and take extra stocks in your luggage. Take copies of your prescriptions, making sure they are written in generic names: this makes them more easily recognisable overseas as not all brand names will be available outside of Australia. It would also be wise to take a letter from your doctor explaining the history and details of your condition in case you do get ill while away or in case there are any problems with carrying your medicine overseas. You should wear your MedicAlert bracelet, if you have one, at all times when travelling, especially in overseas destinations where English is not spoken. It would be better to use a spacer than a nebuliser when travelling as it is cheap and very portable. If you are taking a nebuliser, remember to buy a power point adaptor suitable for your destination and to confirm that you will be able to use it on the plane. Check this with your airline well before your departure date as they may want to check your unit. A foot-powered nebuliser or one that uses a sealed, dry-cell battery are other alternatives. Don't forget your peak flow meter, so you can monitor how well controlled your asthma is. Make sure that if you take out travel insurance it covers your asthma. Sightseeing, trekking and skiing should present no problems if you normally manage to control your asthma. However, you should not scuba dive if you have asthma. Travelling to high altitudes should be fine if you can control your asthma well at sea level, but it can result in asthma attacks if your asthma is not well controlled or if you undertake intensive trekking. Finally, remember to check that your travel insurance policy covers any expenses related to your asthma, which will be classed as a pre-existing condition. As long as you continue to control your asthma as you did at home and are aware of the changes that travel can bring that could affect your condition, nothing should stand in the way of a great holiday. 1. National Asthma Council Australia. Australian Asthma Handbook, Version 1.2. National Asthma Council Australia, Melbourne, 2016. Website. Available from: http://www.asthmahandbook.org.au (accessed Nov 2017). 2. National Asthma Council Australia. Australian Asthma Handbook - Quick Reference Guide, Version 1.2. National Asthma Council Australia, Melbourne, 2016. Available from: http://www.asthmahandbook.org.au (accessed Nov 2017). 3. Australian Institute of Health and Welfare (AIHW). Asthma web report, 22 Dec 2016. https://www.aihw.gov.au/reports/asthma-other-chronic-respiratory-conditions/asthma/contents/what-is-asthma (accessed Nov 2017). 4. National Asthma Council Australia. New mobile Asthma Buddy to help Australians better manage their asthma (31 Oct 2017). https://www.nationalasthma.org.au/news/2017/new-mobile-asthma-buddy-to-help-australians-better-manage-their-asthma (accessed Nov 2017).